Do you directly sell courses to your e-learning end-users? If you do, how are you evaluating (reaction) the courses or the platform in which they are offered? First of all, kudos to Luana to care about learner reaction and satisfaction. As a commercial content provider, it’s critical that her learners see the value in her courses. What I especially like about Luana’s question is that she hasn’t restricted feedback to the course content. She’s also looking to gather satisfaction data related to the platform. I understood the learning objectives. I was able to relate each of the learning objectives to the learning I achieved. I was appropriately challenged by the material. I found the course materials easy to navigate. I felt that the course materials will be essential for my success. I found the room atmosphere to be comfortable. I was pleased with the room set-up. I experienced minimal distractions during the session. The purchase process for this course was straightforward. Logging into the system was easy and intuitive. The learning environment reacted quickly to my commands. The learning environment behaved as it should, free of glitches, or crashes. The learning environment allowed me to assess my progress. Dissatisfaction with the learning environment will impact learner satisfaction with the content in the same way a good meal in a dirty, brightly lit restaurant may result in a poor restaurant review. 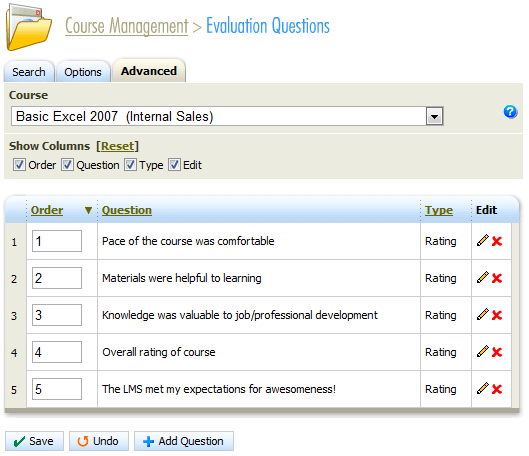 Ask your learners how they feel about your LMS. Address quickly any concerns that may be uncovered through this evaluation.